Banana chips are quite a famous snack in Southern part of India, and they are healthier alternative to the potato chips.Though these are easily available in stores in India,and even in UK I have seen the sweet versions in the superstores, and the regular savoury version is also available, I’m sure the store options do have preservatives, and loads of sodium , high levels of unsaturated fats and a large amount of calories. So I wanted to try these at home, to make a healthier version. Though the amount of calories will be high in the home version as well, but anything home cooked, is way much better in terms of taste and nutrition than the market versions. I tried both the fried and the baked versions. I have not achieved great results in the baked version , so as of now I’m following and sharing the fried version only. 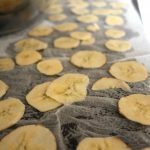 I found many recipes for banana chips on the internet, and liked quite a few. I tried making these at home 2-3 times to perfect these, and these were really easy to make, and turned out really well. 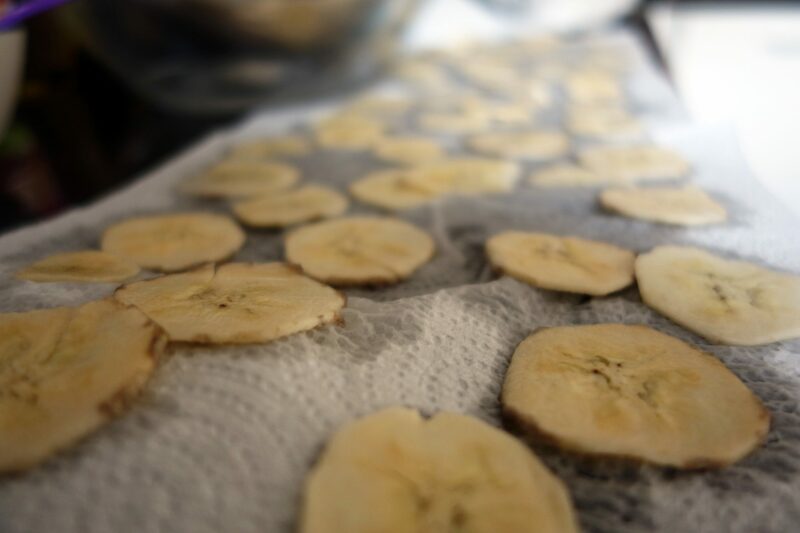 For making banana chips, you would need a few raw banana’s , also called plantains, or green bananas, along with some oil to fry these. 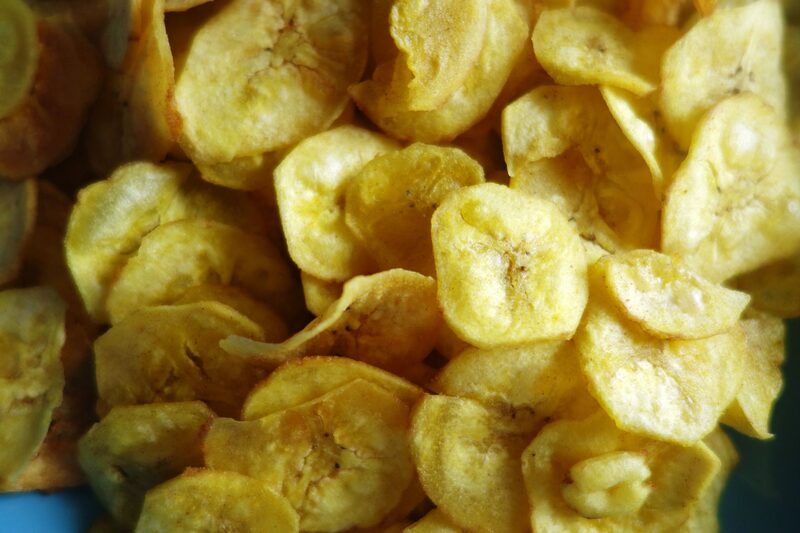 Authentically in south India, banana chips are fried in coconut oil, but if you do not cook in coconut oil, or do not prefer the taste of coconut oil, you can use the regular cooking oil. I would still recommend,making these in coconut oil,as it is much more healthier option, and of course it enhances the flavour of the chips. Don’t worry, you will not get the typical coconut oil smell, but yes the coconut oil does add to the taste. 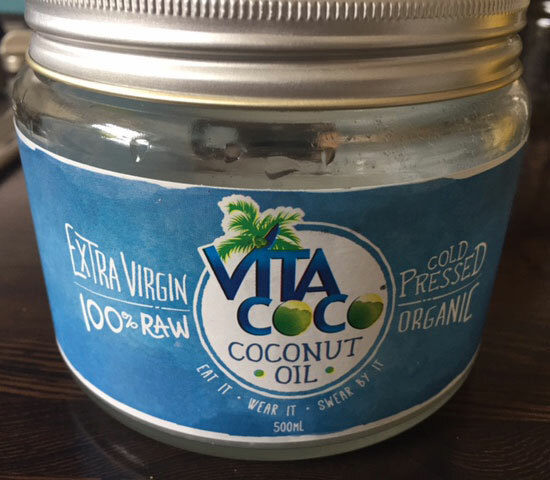 I use EV , cold pressed organic Vita coco coconut oil. This is easily available in any of the grocery stores, or even amazon. You need to trim both ends/edges of the banana’s, make a long slit in the skin, and peel off the banana skin. Once done , wash the bananas in water, and slice them using a Slicer. You need very thin slices, so I suggest using a slicer to slice . It gives really thin slices like that of crisps. Slice the bananas in iced water, and keep in the water for 7-10 minutes. There after, take out the slices, and spread them on kitchen towel. Once sliced, I keep them on a kitchen towel, in a single row, so that any excess water is absorbed. 1.Use a slicer to get evenly thin pieces of bananas. 2.While frying, do not add too many slices in a the hot oil, do not overcrowd the pan, else the chips will stick to each other. 3.Before frying, make sure the oil is hot enough and then fry the crisps on medium heat. Fry till the spluttering of oil, and water stops. 4. 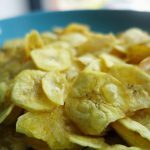 In my recipe, I make a mixture of salt and turmeric in water, and add this to the oil, while the banana chips are still frying, this ensures the salt and turmeric are evenly absorbed in the chips and give the chips a nice golden colour. The other option is to simple fry the chips, and once done, you can add salt separately. 5. You can season these using any seasoning of your choice- salt and pepper, salt and chilli, just salt, or to make the sweet version for the kids, just sprinkle a little icing sugar and cinnamon and mix well. This sweet version is really loved by the kids! 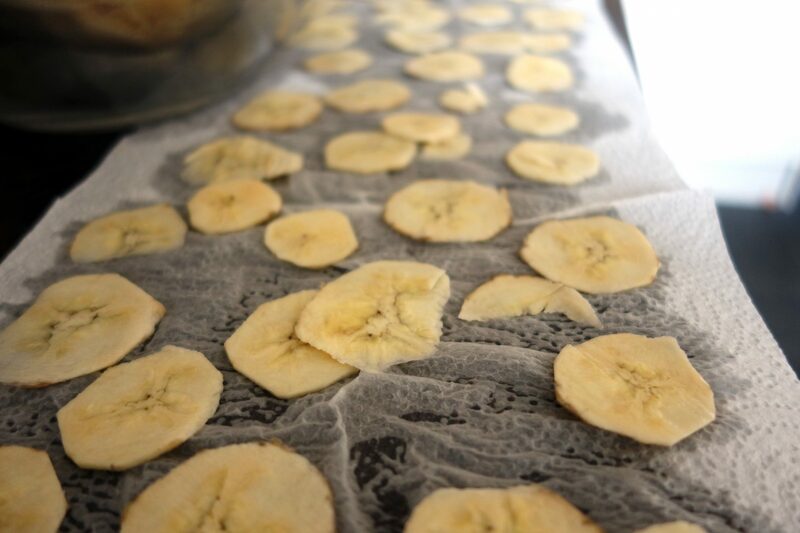 A healthy snack of Crispy raw banana wafers, fried in coconut oil. Mix 2-3 tsp water, salt and turmeric in a bowl, and keep aside. 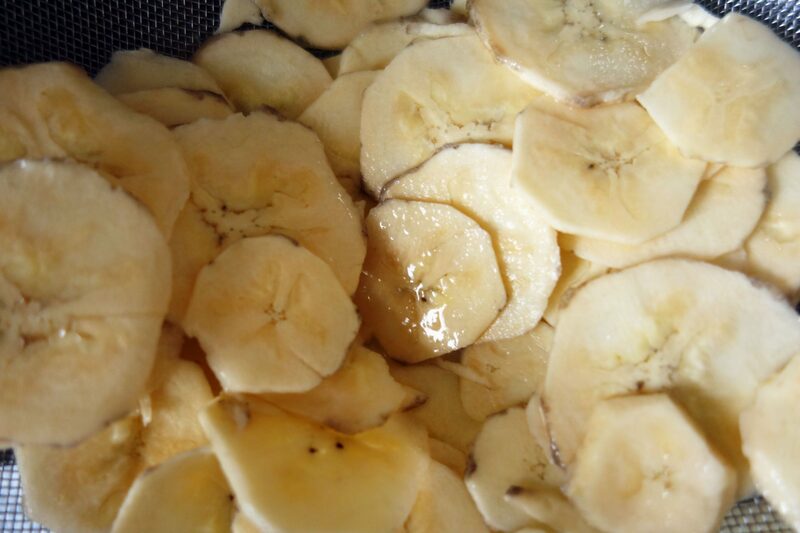 Thinly slice the bananas, and dip the slices in the iced water for 7-10 minutes. Drain the water and spread the slices on kitchen towel, and lightly pat dry them. Now add the banana slices in hot oil, make sure not to overcrowd them, to avoid sticking.If you have a small pan, make the crisps in small batches. Once banana slices start getting crispy, add a tsp of the water, salt,turmeric mix in the oil.Mix well with a slotted spoon. Fry the slices for another 1-2 minutes. Continue to cook on medium heat, till the spluttering stops, and the chips are nice and golden yellow. Take the chips out on a kitchen towel, to drain excess oil. Once one batch is done , fry rest of the batches in the same manner. make sure not to add too much water salt turmeric mix, in order to avoid making the chips too salty. As after frying the first batch, the oil already has salt, the other batches will be too salty if you keep adding the mix too much. Once fried, let them cool. Enjoy these homemade healthy crisps, with a cup of hot tea of coffee!! Or even pack these healthy snacks in your kids lunch boxes.They will be delighted to have it . Use a slicer to get evenly thin pieces of bananas. while frying, do not add too many slices in a the frying pan, do not overcrowd the pan, else the chips will stick to each other. While frying, make sure the oil is hot enough and then fry on medium heat. Fry till the spluttering of oil, and water stops. 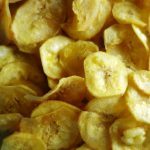 In my recipe, I make a mixture of salt and turmeric in water, and add this to the oil, while the banana chips are still frying, this ensures the salt and turmeric are evenly absorbed in the chips and give the chips a nice golden colour. The other option is to simple fry the chips, as once done, you can add salt separately. You can season these using any seasoning of your choice- salt and pepper, salt and chilli, just salt, or to make the sweet version for the kids, just sprinkle a little icing sugar and cinnamon and mix well.